Our end of season video from these last few months. There is a bit of footage still to go up online from the VWH and various other days out with other hunts which don’t feature in this video, so keep an eye on our page as we’ll keep posting new stuff over the next few months. We’d like to thank Cirencester Illegal Hunt Watch, North Shropshire Hunt Sabs, Bristol Hunt Saboteurs, Bath Hunt Saboteurs, Southampton Sabs and South Wales Hunt Saboteurs who also feature in the video at times and who we have met up with at various points over the season. Again, thanks to Kernow Hunt Saboteurs, Devon Hunt Sabs, Somerset Anti Blood Sports, Dorset Hunt Sabs and Swindon Hunt Saboteurs for a good day out with the Cury / Heythrop down in Cornwall. We had a fantastic day at the Cheltenham Vegan Fair 2016 on Saturday with a shared stall with the wonderful Black Badger Printworks team and a small stall outside on the street. Thank you to everyone who donated / bought cards or recipe book, t-shirts or mugs / played our tombola or just came for a chat. We handed out a huge number of 3C leaflets and leaflets for Gloucestershire Badger Office explaining what is going on in our sabbing areas and getting people interested in becoming active or helping in other ways. Thanks also to Firepit collective who some of our sabs went to see in Bristol that evening. Well done for dealing with ‘the shouters’ using sarcasm – we loved what we managed to hear of the quieter songs as much as the livelier ones. We’ll be seeing more of many of you at other events soon – keep an eye on our facebook and website for details. Thanks! The main hunting season has now come to an end thank goodness. However we did turn out to monitor the final meet of the VWH in Cirencester Park on the Earl of Bathurst’s Estate on the 2nd April. Three Counties Sabs came along to help again who were really welcome given the size of the park – reportedly 8km long and 4.8km wide! They met at Ten Rides in the park and we saw them go directly to the nearest covert. Almost immediately we saw a fox running but foot walkers were well placed and spotted by the hunt staff. The first insult of the day came from a supporter who said ‘If I was Lord Bathurst I’d have you shot! We think he meant the Earl who would hopefully disagree! They chased around the park and then took the hounds over the A419 towards Hailey Wood and on to Coates where the fox was spotted being chased at the back of the sewerage works. One of our team saw the fox run through the field and hedge on to the road in front of where he was standing with the hounds in cry and hot pursuit behind. This is a very distressing scene to witness if you disagree with fox hunting. Sometimes circumstances prevent us from following but we hope the fox got away. The hunt went back in the park across the main A419 and continued to hunt round the polo ground in the park. It was here we saw another fox with hounds in cry. As the huntsman didn’t seem to be calling them off we rated the hounds [told them off] to get their heads up and hopefully lose the scent. The hunt headed north towards Daglingworth about 4.45pm and at 4.58pm we heard 2 shots – luckily nothing aimed at us thank goodness! Around 5pm we heard the hounds in cry again in Overley Wood in the distance. Throughout the day we were followed closely by students probably from the Cirencester Agricultural University nearby. Maybe ‘how to harass antis’ is on their curriculum! More serious incidents followed when 2 of our team where set upon by hunt supporters in the woods and items stolen from them. One of the assailants which we’ve met before tried to steal a camera and caused injury to a finger. Also lewd comments were made to one of our team members. They didn’t get the camera and the footage makes interesting viewing – more to follow on this incident at a later date. We will now be busy working closely with ‘Three Counties Wildlife Crime Watch’ and ‘Outpaced’ sharing skills and knowledge so we can tackle wildlife crime. A huge thank you to everyone who came to our stall at the fantastic Worcester Cruelty Free Fair on Saturday. We had a really good day there, gave away a lot of leaflets and raised awareness about hunting and the badger cull and raised an amazing amount from donations and, it has to be given credit, the tombola. We still have plenty of cards for sale – photos all taken by our active sabs out with hunts or while checking setts, etc. and the cards are made from recycled materials with more environmentally-friendly inks and were sent by carbon-neutral post! All profits go to us and the money we spent went to a small independent business who try to be more eco-friendly, so we’re happy. The cards are blank for your own message to be written in and the 4 designs are a wild boar, deer, a fox and a hound. Thanks again to Lush Worcester for donating the prize for our caption competition – the voucher is going in the post now to the lucky winner. Enjoy! And also to Cirencester Illegal Hunt Watch for keeping the rest of the sab group company for the day at the VWH closing meet – has been great to team up with you again this season. We’ll see some of you again for the Cheltenham Vegan Fair 2016 on the 16th April when we’ll once again be teaming up with Black Badger Printworks – check out their stall / website for some of our t-shirts and mugs! An updated version of our “spottercard” of Ledbury terriermen and supporters. 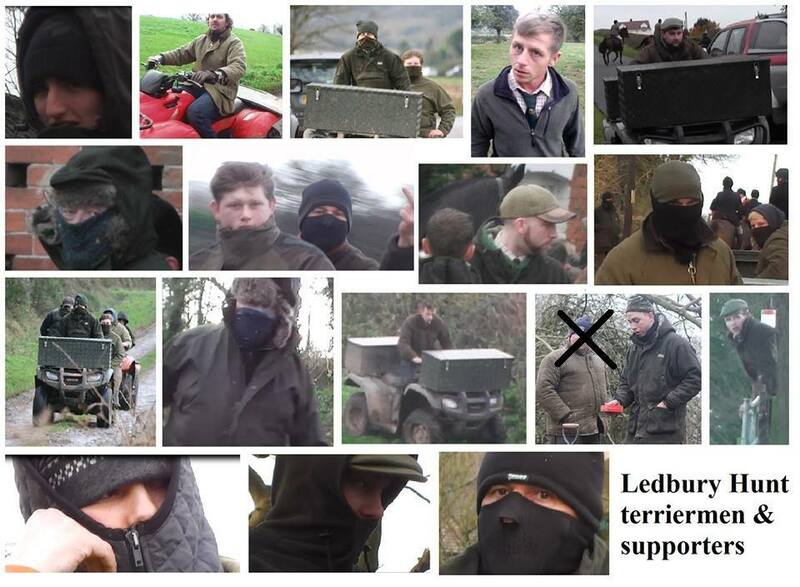 Please note that following a conversation with one of the men in the picture, we no longer need information about him as he is no longer doing terrierwork for the hunt, only following by vehicle, and he has not been involved in any incidents of aggression or digging-out / blocking setts, etc. this last season. Any information regarding the other people, some of whom are known to us by name / nickname already, would be greatly appreciated – please message us privately, email us or call, anonymously if you prefer. Information will not be passed on to others (except for the police) and will not be used to harass the people concerned. We are merely looking to build up a picture of who we are dealing with out in the field, to pass on information to the police in the cases where we need to I.D. a person involved in illegal activity or to use in any civil court case against them.